Andrew A. Jacono, M.D., F.A.C.S. Want To Look as Good As You Feel? If you’re like most people today, you feel the pressure to put your best face forward. You want your outside appearance to reflect how you feel on the inside. Perhaps you’re thinking about cosmetic surgery, or maybe you want to know more about treatments that can be performed without going under the knife. 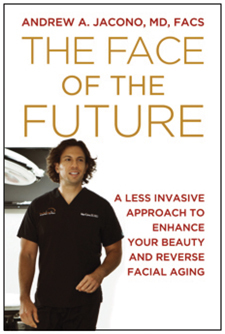 This book explores the ins and outs of facial enhancing and anti-aging techniques, from the hottest procedures in Hollywood to the newest trends in minimally invasive treatments and skin care. Dr. Andrew Jacono is a facial plastic and reconstructive surgeon in Manhattan, specializing in minimally invasive facial rejuvenation and facial cosmetic procedures including nose, lip, cheek and chin reshaping surgery. In this book he describes how the concepts of beauty and balance from the renaissance artists can be applied to all non-invasive and surgical treatments to create natural, non-artificial results. In addition to performing facial cosmetic surgery, Dr. Jacono is the senior advisor to “FACE TO FACE” which provides pro-bono facial reconstructive surgery to victims of domestic violence; he is a volunteer surgeon for Healing the Children. His work with domestic violence victims is chronicled in his television series, Facing Trauma, which appeared on the Oprah Winfrey Network and Discovery Fit & Health Channel. Ten percent of his proceeds from this book will be donated to charities that provide reconstructive surgery to women and children who cannot afford medical care.